The tan leather covering the interior looks perfect as well, as does the wood trim surrounding the main controls. 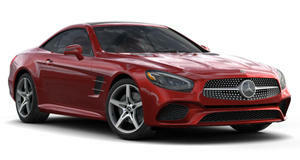 The SL is considered to be the iconic Mercedes-Benz grand tourer. The first generation SL, famously known as the Gullwing, arrived in 1954. Surviving examples sell for a lot more than this fifth-generation model. Currently located in Pittsburgh, Pennsylvania, the car is being advertised on Copart, a website often associated with selling what’s left of crashed cars including several exotics. Its estimated retail value is listed at $12,008 but you’ll have to place a bid if you’re interested. As of this writing, the top bid was only $13,900 but we wouldn’t be surprised to see that climb before bidding comes to an end.